Los Angeles $15 minimum wage: Labor unions want to be exempt from it. Los Angeles Unions Fought for a $15 Minimum Wage. Now They Want to Be Exempt From It. 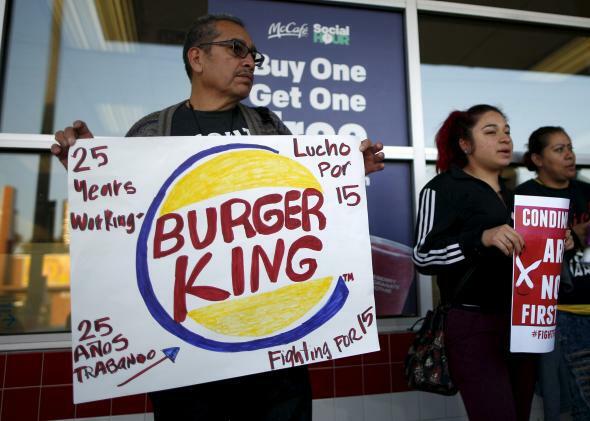 A Burger King employee protests for a $15 minimum wage in Los Angeles. Just like it did in Seattle and San Francisco, organized labor helped lead the fight to raise Los Angeles’ minimum wage to $15 an hour. But now, with the City Council preparing to pass a final version of the bill that would do so, union leaders are asking for a major carve-out that would let businesses with collective bargaining agreements pay their employees less. In other words, they would like an exemption from the very law they’ve been trying to pass. Predictably, the move has led to some charges of hypocrisy from conservatives, as well as pure bafflement among others. In Los Angeles, the Chamber of Commerce is arguing that labor groups want the change so that business owners will simply let workers organize instead of paying the new minimum, which would plump up union rolls. And, you know, I’m sure they wouldn’t be upset if that was the result. But, if Los Angeles is determined to go all in on a $15 minimum wage anyway, this basically seems like a sound idea. It’s been done elsewhere—San Francisco included a union waiver in its recent minimum wage hike, as did Chicago and Oakland—and the minimum wage hike Los Angeles passed for hotel workers also included a version of the clause. * And, unless you have an ideological opposition to organized labor, it’s hard to a see a reason not to do it. To be clear, this is almost surely an implicit acknowledgment by the unions that there are at least some local industries in Los Angeles, such as apparel manufacturing, where $15 per hour is too high a minimum, and workers might prefer to accept lower pay in order to keep their jobs. Otherwise, there would be no point in pushing for it. No rational employee would choose to organize and accept a lower paycheck—plus pay union dues—unless they really, truly thought their job was being imperiled by their wage. Admitting that $15 wasn’t a great fit for every sector of L.A.’s economy probably wouldn’t have been politically convenient in the early stage of the lobbying campaign. But now that the new minimum seems close to becoming a reality—the City Council has voted in favor of it in principle, but needs to approve final legislative language—it can’t hurt to give workers and businesses a safety net if they need it. Beyond that, the idea is just kind of intriguing. Three cities have moved toward a $15 minimum, and potentially two of them will include the union exemption (Seattle has not). It will be instructive to see whether the idea works better or worse when businesses can opt out by embracing collective bargaining. Maybe there would be fewer job losses. Maybe there would be slightly more organizing activity. Maybe neither. But it’d potentially be fascinating to watch a scenario play out where some fast-food restaurants, for instance, let in unions to save on their payroll, while others try to make the math work at $15. Maybe we’d discover that organized labor wouldn’t be so poisonous for the financial health of a McDonald’s after all. The union exemption could also reframe the purpose of the minimum wage in a fascinating way. At Vox, Matt Yglesias points out that some famously progressive Nordic countries get away without legislating national minimums of their own, because they can rely on widespread collective bargaining to guarantee that workers receive fair pay. He argues that the exemption Los Angeles unions are asking for is a move in the direction of that more flexible model. But in a way, I think it’s almost the opposite. Rather than counting on strong collective bargaining rights to ensure livable and economically appropriate wages, L.A. would partly be relying on a high pay floor to spread collective bargaining rights, which in the end might actually be more important. After all, McDonald’s cashiers, Walmart associates, and garment workers face lots of problems, from unpredictable schedules to being assigned too few hours to health and safety issues, that can’t be addressed by a minimum wage alone. Why not give those workers leverage to negotiate for the rights they need most, whatever those may be? *Correction, May 28, 2015: This article originally suggested that San Francisco did not have a similar exemption for unions in its minimum wage increase. This article has been corrected and revised throughout to reflect that it did.